Conyers allegedly settled a wrongful dismissal complaint with a former employee who accused him of firing her for refusing his "sexual advances." U.S. Rep. John Conyers allegedly settled a wrongful dismissal complaint with a former employee who accused him of firing her for refusing his "sexual advances." BuzzFeed News obtained signed affidavits affiliated with the case. The documents say the lawmaker repeatedly engaged in unwanted sexual behavior with his female staff, including rubbing their legs and backs and requesting sexual favors. In two of the affidavits, former staff members said their job duties included contacting and transporting women for Conyers. One wrote, "I assumed he was having affairs with [the women]." BuzzFeed did not name the woman who settled with Conyers. The outlet says she complained to Congress' Office of Compliance in 2014 and settled with the congressman for more than $27,000 in 2015. In exchange, she reportedly signed a confidentiality agreement, and BuzzFeed says Conyers was not required to admit fault. BuzzFeed acknowledged that conspiracy theorist Mike Cernovich initially provided the documents to the outlet. BuzzFeed said it was able to independently confirm the documents' authenticity with the accuser and other people directly involved in the case. This settlement reportedly came out of Conyers' office budget. But on Thursday, the Office of Compliance revealed it's paid more than $17 million in settlements and awards since 1997 for violations of workplace rules, including sexual harassment. This report about Conyers comes as sexual misconduct allegations are being made against other powerful politicians. 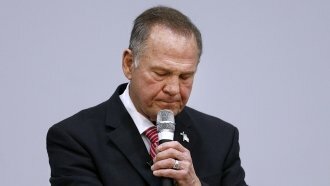 Multiple women have accused Republican Senate candidate Roy Moore of making sexual advances toward them while they were teenagers and he was in his 30s. And on Monday, a woman accused U.S. Sen. Al Franken of grabbing her during a photo op back in 2010. Last week, a Los Angeles television and radio host accused Franken of forcibly kissing and groping her while on a USO tour in 2006 when Franken was a comedian. Conyers initially denied making any sexual harassment settlement, but later acknowledged settling a sexual harassment allegation with no admission of guilt. He's the longest-serving member of the House of Representatives and the top Democrat on the House Judiciary Committee.